With I-Report having celebrated a poignant first birthday amid the bridge collapse in the Mini Apple of Minneapolis, Minnesota, we're all looking back and thinking about the memories we're making of working here. 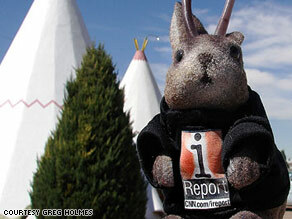 One of the most intriguing I-Reporters I've had the pleasure of speaking with is Greg Holmes of Hutchinson, Kansas, who travels with a jackalope that he's named Ace. A jackalope (cover your ears, Ace!) is a legendary combination of a jackrabbit and an antelope, popular in the American West. Ace has been all over the country, traversing long stretches of highway to find national parks and landmarks of note. The duo started sending I-Reports of winter weather around them, and they became regular contributors after that. Holmes even took the extra step of making Ace a special little I-Report T-shirt. Another contributor that was a whole lot of fun to speak with is Steve Sarner of Fort Lauderdale, Florida. 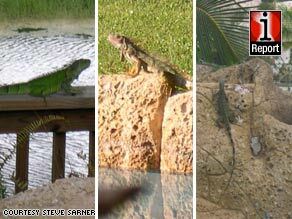 Sarner sent a series of photos showing iguanas catching some sun in his backyard in the middle of February, while the rest of the populace was freezing its collective buns off. The former Chicago, Illinois, snow shoveler described the creatures as his "10:00 lizard." The lizards have a daily routine of moving about his yard and tropical pool area, which includes a bar area inside a faux grass hut. "It's a big slumber party all day with these guys," Sarner said. These kinds of discussions make our day. It's really funny sometimes, and it's dead serious at other times, but it's always great to hear everyone's stories. In the end, the people are what make I-Report great. Now, comment below with your thoughts and send us an I-Report if you've got something up your sleeve.